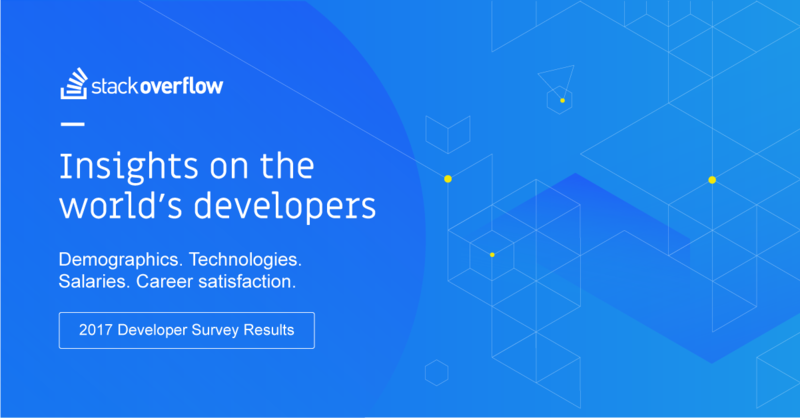 Stack Overflow published their eight Annual Developer Survey results this year, which saw over 100,000 developers take the 30-minute survey. Stack Overflow, a popular developer community and jobs site, revealed the most-popular, top-earning, and preferred programming languages in their 2018 developer survey. Kotlin and Mozilla-developed Rust emerged as the most-loved programming languages, according to Stack Overflow’s 2018 developer survey. For the first time, the coders were asked about the Java-friendly Kotlin by Stack Overflow. The reason probably could be because of the full support that Google gave it in the Android Studio integrated development environment last year. This week, Kotlin was rated as the second-fastest growing language after Apple’s Swift for iOS and macOS app development, by RedMonk, a developer analyst firm. According to Stack Overflow, Python is one of the fastest-growing languages in the ranks of programming languages on our survey, surpassing C# in popularity this year, much like it surpassed PHP last year. In the survey, the developers were asked about their outlook to the future of artificial intelligence (AI). While 73 percent of respondents are more excited about its opportunities than worried by its dangers, only a quarter of them agree with Tesla CEO Elon Musk’s view that government should regulate AI. The cutting edge AI “scares the hell out of me” said Musk this week. Developers working with Erlan, Scala, Ocaml, Clojure, Go, Groovy, and Objective-C in the U.S. get the highest paid salaries ranging between $110,000 to $115,000. On the other hand, developers working with F# have the highest salaries around the world. While the median salary of developers globally is $55,000, but the median salary of developers in the U.S. is almost double at $100,000. Other countries with median salaries above $90,000 include Switzerland and Israel, while programmers in the UK and Germany earn on average just over $60,000. The last year’s survey done by Stack Overflow attracted criticism for the way the women and other minorities who used their site were treated. To avoid any controversy this year, the report has not included the ‘Female Developer Age’ or questions such as identify as ninjas, rockstars, or gurus or whether developers prefer Star Wars or Star Trek. While more than 90 percent respondents of the 2018 survey are men, Stack Overflow says that nine percent of U.S. survey respondents this year are women. However, just 6.8 percent of respondents around the world are women, which saw a one percent drop since last year’s survey. The survey also looked at the varied representation of women and men in different developer roles. Stack Overflow finds that women have the highest representation as academics, QA developers, data scientists, and designers. System admins and DevOps specialists are 25 to 30 times more likely to be men than women, while developers who are educators or academic researchers are about 10 times more likely to be men than women.